The Phantom 2 is DJI’s all newest Phantom version. 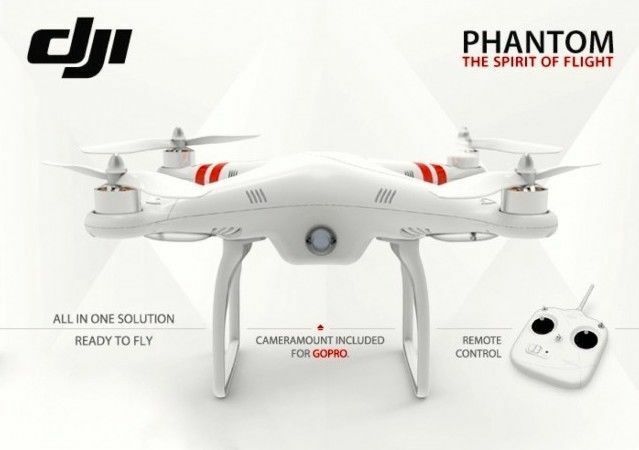 It is very similar to the DJI Phantom 2 Vision (which goes for more than double the price) but without the Wi-Fi camera. Great for those looking to use the worlds top selling quadcopter for non-photography purposes or with the GoPro/other cameras. – Out of the box support for the DJI H3-2D Gimbal without the need to buy any installation kits (just purchase the H3-2D itself). The Gimbal allows for better camera stabilization than the included GoPro mount as well as user pitch control while flying. – Functions of the Phantom 2 can be expanded through its Can-bus module which can be used for an IOS or 2.4GHz Bluetooth Datalink. – Integrated GPS auto-pilot system offers position holding, altitude lock, and a stable hovering for amazing camera focus. – If the Phantom 2 and its controller disconnect during flight for any reason, the Naza-M autopilot system’s failsafe protection will come to the rescu. Outputs of all command sticks on the controller will go the the center position and the Phantom 2 will return to home and land automatically. You can also program a one key go home function through the software. – IOC mode allows for simple control of the Phantom no matter which way it is facing. – Custom power management system monitors power capacity and voltage of the battery. If the power drops below safe levels, the Phantom 2 will land automatically. The power level of the battery is indicated via 4 LED’s on the battery itself. Battery also snaps into place and has a built in on/off button. – Dynamically balanced self tightening propellers allow for worry free movement during flight.